If you are seeking an entry-level motherboard which offers you the best utilities for both your home and office PC usage, you need not look further than the GIGABYTE GA-B85M-D3H motherboard. Available at a price that won’t put a dent in your wallet, the motherboard provides an extensive array of features and peripheral support normally not found on motherboards of its class. For office usage, the feature that makes the GA-B85M-D3H shine is support Intel Small Business Advantage, a suite of technologies designed to offer greatly superior and simplified control over unmanaged IT infrastructure, with a distinct focus on security, data backup and raising the overall productivity levels. Comparing it with other brands in the same category, the GA-B85M-D3H comes with more VRM heat sinks, power phases, fan headers and audio ports. It also offers beneficial connectivity options including COM support, LPT (Line Print Terminal), SATA 6 Gb/s as well as USB 3.0 support. The GA-B85M-D3H is a part of the GIGABYTE 8 series motherboards, which support 4th generation Intel® Core processors and Intel® B85 chipsets. It comes with the HD4600 Intel® processor graphics that provide native 4K resolution playback over standard HDMI connectivity, with significantly higher frame rates in the latest DX11 3D game titles. This means users don’t even need a discrete VGA card since the Intel has built this powerful graphics engine directly into the CPU. You also don’t require a third-party sound card because the product is fully compatible with surround sound systems, having a 7.1-Channel Realtek ALC892 sound processor. Now store and transfer large files faster than ever with plenty of room to spare with the HP x755w. PNY has officially released the massive 128/256GB memory sized HP x755w on the global market. With USB 3.0 specification, enjoy next generation speed performance with transfer speeds up to 10X faster than any other standard USB 2.0 Flash Drives available. With up to 128/256GB of memory space, it’s the perfect solution for easily storing and quickly transferring all your large documents, high-resolution photos, HD videos, and more. The drive is ideal for students or working professionals who need to store large amounts of data everyday for school projects or work projects. The HP x755w is a high-capacity pen drive that comes packed inside a sleek and smooth high-grade plastic casing. It comes in a cool shade of blue and white, a classic yet modern look. The drive incorporates a cap less sliding design that eliminates the worries of a misplaced cap. To connect the drive, simply push it to the end to reveal the USB port underneath it. Designed with portability and convenience in mind, the x755w features a key hole located at the end of the drive, which can be easily attached to key chains, mobile straps, wallets or backpacks. Slim and compact, the drive weighs in at 8.8g and measures at H 9.5 mm x W 17.2mm x L 55mm. Simple plug and play operation indicates that no extra software or installation is required to use the drive. Transfer and share your important files with exceptional speed improvements, which allow quick and easy transfer of all content. The drive is backwards compatible with USB 2.0 ports, so you can utilize any USB 2.0 or USB 3.0 port with full support. The x755w works virtually with any operating system and is compatible with Windows 2000/ XP / Vista, Windows 7, 8, Mac OS: 10.3 and above. Now available in 128GB and 256GB memory space, perfect for storing all the large media files or software applications. It comes backed with a promised warranty of 2 years within the date of purchase. The HP x755w is light in weight, but big on performance. Capable of projecting a 100-inch image with only 1.7m distance to the projection surface, the Acer K138ST is an ultra-portable short throw LED projector with all the essential entertainment features enabling people to enjoy cinema on the go. Smaller than a sheet of A4 or letter-sized paper, and weighing just 0.75kg (1.7lbs), the K138ST has powerful built-in DTS sound audio so it can easily be carried anywhere without requiring additional speakers. The Acer LumiSense+ enabled K138ST is the world’s first LED projector equipped with an intelligent ambient light sensor. This allows the projector to optimize image brightness and color saturation based on ambient lighting conditions, ideal when carried from place to place. The projected image is vibrant and sharp with 100,000:1 contrast at WXGA resolution, while built-in Bluetooth audio connectivity allows it to wirelessly stream audio to a nearby Bluetooth speaker or home theater. The Acer U5320W is an ultra-short throw projector that can be placed as close as 23cm (9.1-inches) from the projection surface, and the ability to can project up to 100-inch images at a distance of 50cm (19.7-inches), providing greater space flexibility. It also eliminates shadowing and enhances viewing comfort, a significant benefit for classrooms. The U5320W’s WXGA resolution and 3,000 lumens brightness creates crystal-clear and vibrant images, while its 2x10W speakers provide powerful sound. When paired with an optional Acer SmartPen II, the U5320W is ideal for classroom settings, allowing on-screen writing from up to a 32-foot distance for up to two users, and working as a remote control to encourage interactive learning. Capable of projecting 1080P Full HD high-resolution images at up to a 4,000 lumens brightness, the P5515 provides a clear viewing experience even in bright environments and from long distances from the screen, making it ideal for mid-sized meeting rooms. It has built-in 2x10W speakers that deliver power sound without requiring external speakers. The P5515 is flexible for different installation scenarios as it supports both vertical and horizontal keystone correction of image distortions up to 30 degrees. It also supports 4 Corner Correction, enabling users to adjust distortions from any corner, so that images can be projected on sloped or asymmetric surfaces. 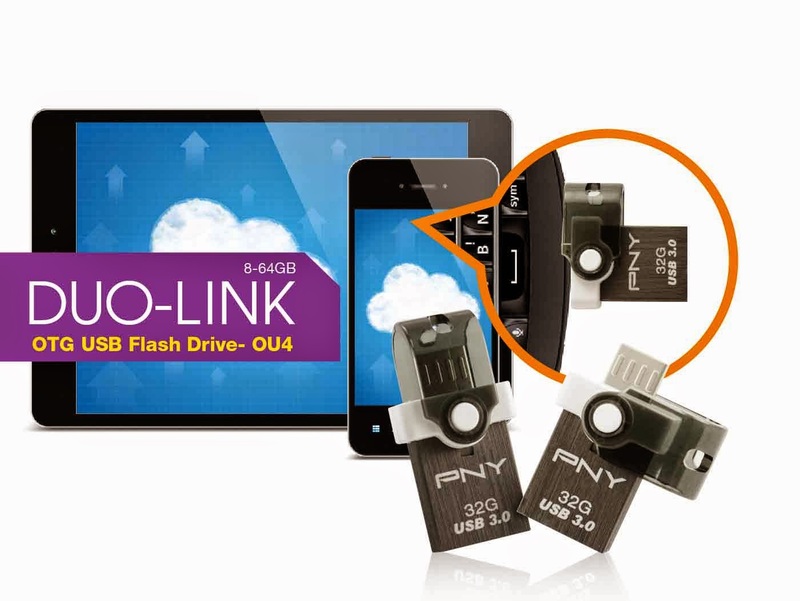 PNY announced the release of their latest OTG flash drive, the DUO-LINK OU4 OTG USB 3.0 drive. It provides an alternate external storage solution for adding digital content and transferring it from a computer to your smartphone, tablets, iPads and more. The drive offers fast transfers of photos, videos, and music to any computer with a USB 3.0 port, making it easy to free up space on your Android device.The OU4 comes manufactured in durable metal casing and features a swivel design cap that can be rotated to the side to reveal the microUSB 2.0 placed underneath it. The swivel plastic cap is cleverly attached to the drive, which makes it convenient to slide it back when not in use and protect the port from dust and scratches. For added mobility, it features an integrated strip hole located at the cap, so it can be securely attached to your mobile straps, keychain, wallets or it can be looped around a lanyard and adorned as an accessory. The DUO-LINK OU4 is an extremely lightweight pen drive that weighs only at 2.8g and measures at thumb-sized dimensions (29.05mmL x 15.1mmW x 10.25mmH). Super speed USB 3.0 specs combined with trusted PNY technology delivers the finest read and write performance of all your media content, be it movies, images and music. It delivers transfer rates of up to 120 MB/s read and up to 20MB/s write(32/64GB), which transfers files 5x faster than traditional 2.0 OTG drives available in the market. The DUO-LINK OU4 USB 3.0 supports the latest operating systems like, Windows 2000, XP, Vista, 7 and 8, and Mac OS: 10.3 and above. It’s also compatible with almost all the latest Android smartphones available in the market supporting Android 4.0 operating system and later, including Sony, HTC, Samsung and LG. A generous 64GB storage capacity provides enough space to capture images and videos from your smartphone. The DUO-LINK OU4 is backed with a promised warranty of two years within the date of purchase. It is so convenient to have portable flash drives are handy for transporting files, but they're only useful if you can actually remember to bring them from the office to your apartment next time you need to tackle a little work from home. I just got a nice looking yet useful flash driver from my sister to clip on my bag. 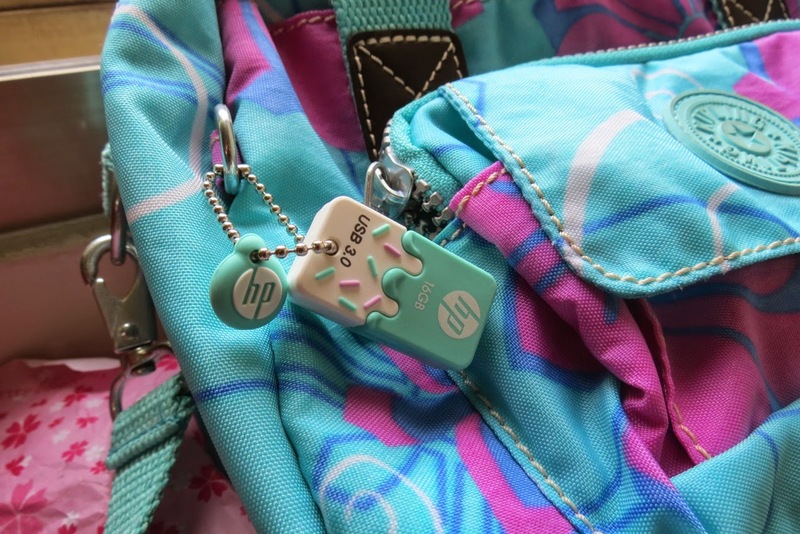 The HP x778w USB 3.0 flash drive 16GB is a trendy fashion accessory perfectly matched with my bag. Now I can carry it around without worrying losing it. The HP x778w is a thumb-sized USB flash drive that weighs 8.1 g and measures at L 32.5mm x W 17.5mm x H 9.5mm. The unique design resembles a partially melted ice cream layered with sprinkles below it - giving you a fun way to store your files. 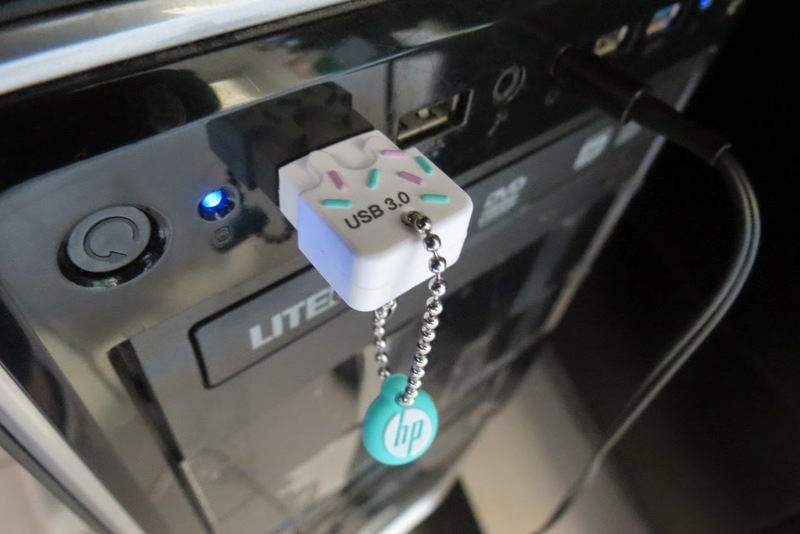 Lightweight and compact, this ice-cream inspired USB flash drive is made up of durable rubber housing. The cap can be conveniently attached to the end of the drive and remains secure while the drive is in use. When I plug it into my PC, it was recognized immediately and is ready for files transfer. With 16GB capacity, it can store thousands of pictures or songs on the go. I am very happy to have this HP x778w USB 3.0 flash drive as it looks really matched with my bag. It is extremely chic and lightweight that promises the great ease and convenience for daily use. Patriot, a leading manufacturer of computer memory, USB/flash, SSDs and mobile accessories, today announced the launch of its new M.2 Ignite solid-state drive (SSD). Its compact form factor is optimal for use in portable devices such as ultrabooks, notebooks and ultra-compact PC’s providing impeccable start up times, instant access to data and installed programs. Share and transfer large media files in no time with the new 128GB PNY Hook Attaché USB 2.0 flash drive. PNY released the Hook Attaché with 128 GB storage capacity. The enormous 128 GB capacity makes it simple to transport all of your digital stuff. Now store all your favourite movies, music and images whether it’s an HD file or high resolution image file, the Hook Attaché has ample storage space to ensure all your files are stored in a safe and secure manner. The PNY Hook Attaché has a high-quality silver finish with a sleek streamlined appearance. Its exterior covering is water proof, dust proof and shock proof, and can endure frequently daily use. The cleverly designed carabineer hook design enables the drive to be securely attached to keys, backpacks, handbags or any other accessory. The convenient capless design makes it handier and eliminates the worries of a misplaced cap. Available in capacities up to 128GB, students with loads of assignments and study materials required can store all their files and may never have to worry about running out of memory space. Easy plug and play operation makes it easier to transfer and share files. The PNY Hook Attaché also comes available in storage capacities at 8GB, 16GB, 32GB and 64GB, respectively. It works smoothly with Windows 2000/ XP / Vista, Windows 7, 8 Mac OS: 10.3 and above operating systems. It comes with a promised warranty of 5 years from the date of purchase. Samsung India Electronics has been awarded two Golden Globe Tigers Awards for its initiatives to empower disadvantaged children and youth through its CSR initiatives. The “Samsung Smart Class” initiative received the award for Excellence & Leadership in CSR under the category Support and Improving the Quality of Education, while the “Samsung Technical School” initiative was awarded for Excellence for Sustainability Leadership under the category Best Project Collaboration. The Awards were announced last week in Kuala Lumpur, Malaysia. The Samsung Smart Class initiative aims at bridging the digital gap in India while improving the quality of education provided to disadvantaged children. Smart Classes are equipped with Samsung interactive whiteboards, laptops, printers and Wi-Fi to enable students to learn in a digital, interactive environment. Over 120,000 students in 200 schools across India have benefitted through the initiative to date. Teachers who teach using Smart Classes testify to increased attention and participation from students during lessons, as well as higher familiarity among students in using laptops and printers. Transcend Information, Inc. is proud to announce the launch of wide temperature SDHC and microSDHC memory cards to its industrial memory card product line. The cards can operate effectively between -40°C to 85°C and are ideal for use in small form factor devices with demanding performance and capacity requirements. Transcend’s MLC-based SDHC and microSDHC Class 10 memory cards are the most reliable high speed and high volume storage solutions that offer optimum protection. Compliant with SD Specification Version 3.01, Transcend’s MLC-based SDHC memory cards boast high-speed transfer rates of up to 20MB/s and an extra large 32GB capacity. The SDHC cards can operate between -40°C to 85°C and still offer outstanding compatibility in industry-standard devices, including handheld bar code readers, POS terminals, in-vehicle advertising and entertainment, medical computing, set-top boxes and surveillance systems. Manufactured using high-quality MLC flash chips, Transcend’s industrial-grade microSDHC cards guarantee superior performance and long-term stability. Combining the top-of-the-line Class 10 speed rating, these cards provide impressive transfer rates of up to 20MB per second. Thanks to their fast data transfer rates, enhanced reliability and available capacities of up to 32GB, the microSDHC Class 10 cards are ideal for latest digital cameras, DV recorders, mobile phones and portable vehicle navigation systems, and can endure extreme temperatures between -40°C to 85°C. To ensure the utmost level of quality, all Transcend’s industrial products undergo extensive testing in all stages of production. The SDHC cards and microSDHC memory cards feature built-in Error Correction Code (ECC) that helps detect and correct potential transfer errors. Additionally, the cards can deliver peak performance under harsh environmental conditions. For instance, they are not only Temperature proof, but also Waterproof, Static proof, X-ray proof and Shock proof, offering its users the optimum protection. Kingston, the independent world leader in memory products, today, announced the launch of its 4th generation HS4 All-In-One Media Reader. The multi-function reader improves upon the previous model as it reads all major card format types including the latest SD card speeds (UHS-I, UHS-II) and CF Type I and II (UDMA 0-7). 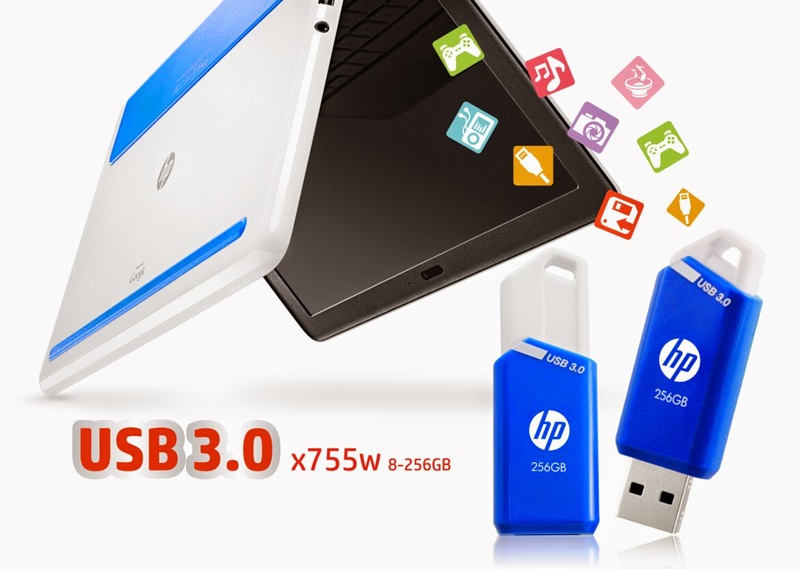 Users can easily back up and transfer music, photos, videos and other digital data with USB 3.0 high-speed performance. This allows users to save time transferring files as USB 3.0 allows up to 5Gb/s data transfer speed – almost 10x faster than USB 2.0. The portable, small- form factor reader has a brushed nickel case and is backwards compatible with USB 2.0. Kingston® also announces a new 64GB capacity addition to its CompactFlash Ultimate 600x family which will soon be available in India. The 32GB and 64GB CF Ultimate 600x cards offer premium results with speeds up to 90MB/s read and write to support burst mode photography or HD video. The addition of MediaRECOVER® software lets users recover deleted files and restore corrupt files, if needed. HS4 All-In-One Media Reader carries a two-year warranty while the CF Ultimate 600x has a lifetime warranty. Both products are backed by legendary Kingston reliability and free technical support. For more information, please visit www.kingston.com.